I bought Steve Jobs on the way back from my recent trip to India. Sick and dreading the impending long flight back to Los Angeles, I browsed in the bookstore at the airport and found this, which was on my to-be-bought book list. Earlier times I dodged at buying this book mainly because of price, but in Indian market books tend to be significantly cheaper. Yes, for around $8 I could get a brand new paperback version of this book. It is kind of surprising even to me that I think about price when it comes buying anything related to Steve Jobs, but hey, this is not his product per say! Walter Isaacson is an accomplished author and biographer, and he did an astounding job on Einstein’s biography (which I got as gift from my dear friend and author Patrick Barry, of which I wrote a review earlier here). But when it comes to writing a book on Steve Jobs, one needs to be good at grasping the tech stuff and I must say Isaacson did a fantastic job of that. Except for a probable very minor mistakes, which I mostly think his reviewers probably guided him wrongly, his job on this book is phenomenal. Here is my take on this book and want to share how my perspective of Jobs and his work got substantiated by this book. I am not touching on any of his personal life aspects which are perhaps interesting from a people point of view, but my main perspective here is on his life’s work which changed our lives. 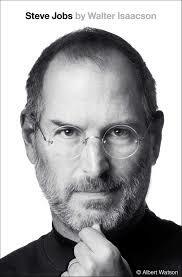 The book starts with Steve Jobs childhood and the events that transpired in his life. It’s in chronological order and covers it very extensively. It deals with the human, technological and visionary aspects of his life in a very vivid and lucid way. The book could result in a multi-part movie franchise or a TV series, but the recent movies made out of this book or based on other sources about Jobs are so stupid and pathetic. Jobs himself must be turning in his grave thinking about how lamely these movies, shows are made. But this biography is written very well and captures the essence of Jobs: his vision, his philosophy, his passion, his perseverance, his petulance, his obstreperousness, his single-mindedness, his stubbornness, his constant bristling until something gets done and his ability to induce the reality-distortion field in the programs, projects and people that surrounded him during his life time. The author highlights how Jobs’ persistence alone paved the way for several ground-breaking products starting way back from Apple I to the recent iPad. In fact, the earliest sign of how hell-bent Jobs could be when it comes to something he wants to do is when he called the Hewlett Packard CEO (of that time) to get the components for making a frequency counter as his high school project. He not only manages to get them, but also gets an internship at HP over the next summer and gained early knowledge of how a corporation works, or more importantly, how it doesn’t work. Jobs was able to cut the stupid red tape that stymies most companies and propel Apple to dizzying heights later in his life. The conceiving of Apple I was a marvel. At that time, microprocessors were only for serious electronics hobbyists and for pet projects that customize some gadgets. However, the idea to combine that with a type-writer type keyboard along with power supply was revolutionary. The very minimal Basic Language was supported, which can be used to program and accomplish various computing and display functions. But the real greatness of Jobs is that he did not stop there or continued the concept’s development in a linear way. He was never satisfied until a product takes shape in the most organic way, and the continuous increase of productivity that entails it. This was because Jobs sees a computer to be an extension of humans and he wants it to be done in the most natural way. Hence, Apple II was made which was more powerful and integrates the display, memory, storage and keyboard. Many already know that Steve Wozniak was the engineer with the brainpower behind the design of the complex mother board for it. He made the era of PCs possible with the ability to get the CPU, memory, and other components assembled on a PCB. Not only that, but Woz was instrumental in developing the floppy disk interface for Apple II onto one of the slots meant for adding external controllers, and he was said to have done it in the most economic way of the time and enabled bring down the cost of the unit. He also enabled color graphics and interface to a regular TV set as a monitor. The genius of Woz’s marvelous engineering feat was unprecedented at the time, however, this review is not about Steve Wozniak, so I won’t digress. But the most important contribution from Steve Jobs which enabled the concept of personal computer was the switch mode power supply (SMPS) which led to a compact rather than a linear power supply to support all the electronics in the unit! When integrated circuits (ICs) were made possible to be etched on the same silicon, it was possible to build systems to scale on them but as more of them were added more power was needed. The power budget was ever increasing on these systems. hence the use of SMPS was crucial to make a personal computer light weight. It is less appreciated than the CPU and memory components, but no less important. The current very compact USB chargers that accompany Apple products can be traced back to this design which used the ever advancing semiconductor technology to convert AC to DC. Steve Jobs plays an important role in getting the right person, Rod Holt, to design it and rightly saw that as the future for personal computers. Jobs’ never ending job was to humanize these machines and get them into the hands of millions. So when software was being written for them, Jobs was insistent on making the features look as seamless and beautiful as a talented artist’s finished piece. Jobs was relentless on getting this done to the point where he even perhaps lost very many talented engineers in the process. However, the concept of piecing together the hardware and software as one inalienable product is what makes Apple products look and usability far above many other computer products to this day. This has unleashed the PC-era in computing and the first time computers are seen as a consumer product and not just machines used by professionals like engineers and scientists. Despite it’s revolutionary design, Apple II was still not what Jobs thought was the perfect personal computing device. It’s display, keyboard, and disk drives are still separate units, and it is not very movable compared to the TV or radio of the time. This is what eventually led to the Macintosh, but it was not a perfectly smooth transition. The Lisa was there in-between too! Lisa was supposedly a super charged version of Apple II with a graphics user interface (GUI) and pointing device later which we now call “the mouse”. But by the time it was brought out as a product its cost was humongous or even outrageous ($9995 at that time which equals about $23000!) It was touted for the use of individual business owners, but Steve Jobs was actually booted out of this project midway for tormenting of the engineers involved with his ever uncompromising demands. Sometimes they were unreasonable, but it mostly makes sense given that the next project he was forced to take up (the Macintosh) was a huge success and actually surpassed the sales of Lisa. As Jobs was kicked out of the Lisa project, apparently there was no one in that team thinking about how to make organic changes to the unit while also not compromising on the new technology. For example, the CPU on the Macintosh was more powerful, Motorola 68000 @7.89 MHz, whereas the one on Lisa is a mere 5 MHz. Not just the CPU though, even the disk drives were the pathetic 5 1/4 inch floppy drives even though there was upcoming technology of a 3 1/2″ floppies which are much more robust and dust-proof. Jobs could get the new drive technology into the Macintosh which was supposed to be a cheaper version of Lisa. Lisa’s project team failed to take the risk of leaping to newer technologies! Even the use of the mouse as a pointing device on screen was made prominent by the Macintosh rather than the Lisa, which it has, but the software on it failed to unleash its potential. To this day, Jobs’ philosophies and uncanny ability to push for future technology is all the more evident with the subsequent removals of disk drives, CD/DVD drives, and most recently even the headphone jacks from iPhones! Jobs was the reason Apple truly survived and become an iconic brand, period. The Macintosh was the first Apple product which truly had Jobs’ imprint in every aspect. The Apple II was a great product and was an ice-breaker for PC evolution, but it was still not complete. The majority of its design was by Steve Wozniak who wanted it to be more expandable and economical, but had scant need or necessity of it to look less like a machine. Steve Jobs wanted a PC that is opposite of that, one which looks beautiful, ergonomic and inseparable from what it’s made of in its existence. Steve Jobs is no way comparable to Steve Wozniak in terms of technology prowess, but in terms of vision and how to get “it” to the customers or even creating those customers, Jobs’ contributions are unparalleled. Apple’s Macintosh was another path-breaking product which provided GUI, storage in compact drive, really good computing power, and was the first graphics based operating system which enabled lot of powerful applications. (Although several features were actually borrowed from Lisa, it was the marketability of the Mac that actually enabled getting them to masses.) It paved the way for the PCs and Windows operating systems from Microsoft, although the sanctity of integrated hardware-software approach was abandoned in them. The Mac’s success story should have continued. but in an unexpected way Jobs himself gets booted out of Apple by no other than the guy who he helped become CEO in the first place, John Scully. Back in those days it was unthinkable to have someone as young as Jobs, who was 30 at the time (not quite Mark Zuckerberg, but relatively speaking still young), as the CEO. A burgeoning company like Apple was thought to need an experienced guy. As it t turns out. Scully didn’t get what needed to be done for technology products and without any wonder Apple nose dived. All this happened perhaps for the good of the world, as Jobs goes out of Apple and incorporates a company called NeXT which actually comes up with a very good, unix based operating system with wonderful features woven into it. Although NeXT fails to bring a successful hardware product, their software and its infrastructure are pivotal in building the next generation Mac OS when Jobs eventually rejoined Apple after it was almost in tatters by 1996. But during the interregnum, Jobs explored the media world which was instrumental in making future Apple products ‘insanely great’, but also in creating Pixar Animation, which unleashed the next era of high quality, highly acclaimed animation films after Walt Disney’s original marvelous creations. But for Steve Jobs’ persistence and foreseeing, we would not have had Toy Story, which paved the way for other CGI computer animated movies for years to come. When Jobs was back at Apple, he clearly saw what was going wrong and didn’t take long to get Macs back to popular demand through the revolutionary design of integrating the CPU into monitor and also making it look really cool. It was called “the iMac”. The ‘i’ in the iMac was for internet. It only took two steps to connect to internet as opposed to half-dozen needed on regular PCs. Then, the “iConcept” we are all so familiar with caught on like a fire. However, as Jobs’ nature was never simply content with what is good or even great, he looked into other technologies where the computing power can be used to enrich music, cell phone, books and video, which eventually resulted in insanely great products like iPod, iPhone and iPad. At the time the iPod was brought out, there were many different MP3 players, and there was online access to music (although via Napster, etc, by which the music industry was reeling from piracy). No one would have seen a business case in developing iPod at that time except Jobs. How? By utilizing a computer’s versatility to be able to organize and make thousands of songs accessible to customers literally at their finger tips in an instant. It not only saved the music industry from disaster, but it also saved the electronics or computing industry from being seen as a bane of their artistic world where it gets stolen easily. The music industry initially winced at buying into Jobs’ proposals of selling each song for 99c each, and it took some of his unrelenting pursuit to make that happen. People may say someone else would have figured out this, but not this early, nor this beautifully perhaps. Jobs was relentless on making things that are not just great, but insanely great. Not only that, he knows his place in history and wanted to make sure even that was done by the best possible biographer of his time. He didn’t seem to like someone else getting the idea of writing his life story and not presenting it the right way. So he commissions Walter Isaacson to write it, but promises he would give full liberty to author and not interfere in anyway to make it less authentic or more biased in his favor! He sticks to his word and wouldn’t even read the proof copy although it was almost ready before he died. Even when he was at Pixar and making Toy Story, he was making sure technology was being used at its full potential and never interfered with the creative aspects of it. Even for Apple products he would leave most of the creative aspects to Johnny Ive and the rest. but he would make his judgement call after the products are done and presented. For his own biography, he refrained from that completely in order to save its authenticity, but even there his marketing instincts didn’t die. Unfortunately, his time on earth was cut short, much shorter than an average person lives nowadays, and is perhaps saddest thing to happen, especially for the tech industry. There are still so many unfinished jobs like making the TV experience truly enriching, the automobile industry, and so on that he could’ve worked on. Apple and many other companies are at these tasks, but I wonder if anyone have as much of an integrated approach as Jobs. We will see. All the aspects of the history and life of Steve Jobs are well painted and pictured in the book by Walter Isaacson. In terms of gathering several details, knitting the narrative, and presenting them in the book was a mammoth undertaking. But the book is more wieghted towards the earlier aspects of Jobs childhood and work on technology , the Apple I, II, Macintosh, more than the later products from him namely the iPod, iPhone, iPad. It is perhaps because of author’s penchant for more past history than immediate one or perhaps there is a gag order from Apple on how much should be revealed. 🙂 Nonetheless the book is thoroughly recommended to anyone who wants to know, not just about the magic of Steve Jobs, but for someone who’s interested in the PC revolution and the digital revolution that is still unraveling as we speak. I would like to end this review with a personal note of mine. Steve Jobs is one guy to whom I can directly relate to. What I do everyday for my livelihood as well as for a way of digital life now. I guess there are millions of other people like me, but I must tell how he was probably the reason for what I came to work on from my first job to my present one. Back in the 1970s, a computer means it is big and needs some heavy facility to host and maintain. It also needed huge resources like vast power, air-conditioning, and man power to maintain it! It was unthinkable that households and individuals can have one in their rooms or on their laps or in their hands! Steve Jobs was perhaps singularly responsible to make that possible, if not responsible for hastening the process of getting computers humanized. Make no mistake Jobs was not the tech wizard to get this done, but he was the tech visionary who made it possible to get the personal computing invented in a beautiful way and into the homes of the masses. As many people know, or by now reading this, it was not Steve Jobs who designed Apple products in terms of technology, which range from the first ever personal computing machines to the first hand-held computers now. But it was Jobs who decided the look, format, and usability of those machines which is what matters to the end-users, most of whom are casual consumers. The inside deign of it and its brilliance is opaque to most users, and this was realized by Jobs very early. In fact, when Woz was insisting on having more number I/O slots (input and output ports which can connect to other devices like printers, scanners etc) in the apple II, Jobs resisted having them because it was making it clunky and unwieldy! Jobs outlook is to make the computer as appealing and user friendly as it needs be an extension of ourselves like clothes, jewelry, or one day perhaps an extension of our body in a natural way. When we buy clothes most of us won’t first think of top quality yarn, but rather how they fit in terms of color and design that matches our tastes. Jobs made sure the computer is designed in the same way so the tech and the inside wires and razzmatazz won’t be intimidating and less accessible. The ushering in of this paradigm which propelled the personal computing revolution in a big way. The gaining popularity of Apple computers made IBM get into that line of business and soon started their own PCs, but they are no where near the human appeal what Apple computers have, at that time or even now! IBM made it open architecture touting that will unleash more creativity, which it did in terms of technology, but they didn’t get the gist of making computers as beautiful as a dame to be appreciated. It is not just that Apple computers are only for aesthetics but the software which enables its operation, and the graphics tend to be as smooth and likable to keep going back to the machine.The very push by Jobs to get computer to personal realm was in time for me to get into a project which used PC as the processing and display device of the Spectrophotometer on which I worked. The open architecture of IBM PCs was good to get customized for various applications much more easily and gained popularity. In fact, this actually enabled me to finish my first project in my first job in time back in India where technology was always catching up. So I am actually a personal beneficiary of this approach, but I am still at odds with this approach when it comes to usage of PCs as consumer products. For making engineering equipment and professional or enterprise purposes it is okay, but for true personal computing it actually spoiled the beauty of what Steve Jobs hoped the PCs would be. Microsoft came in along to nicely utilize that popularity by throwing in its OS, first the DOS and later Windows operating systems, making most of it free. This ‘free’ availability of this along with increased number of electronics and chip makers made PCs very economical and had the ready appeal to many. Microsoft software is free, but it is buggy and somewhat deficient in having a coherent approach as to how the computer can be user-friendly. They started added features as they saw Apple’s OS adding features just by aping them. Since their features did not arise out of a central design philosophy, no wonder it looks patchy, ugly and several times haphazard. But still, for many people it is “cheap” and readily affordable. The “cheap” claim I have to dispute because a lot of these PCs which claim to be cheap won’t last as long as a typical Mac, and the customers end up spending as much or more on upgrading or refreshing their PCs. It is not in terms of hardware even in software which comes free with PCs several times, it entails the prospect of dealing with viruses. Since the software development is also open architecture, hackers can have a field day and wreak havoc in such systems. Nonetheless, this type of approach in personal computing resulted in a huge industry and gave employment to lot of people, but it could have been done in a way that is more organic and elegant in development and less virus-prone. The current method of app development on mobile devices and even on the Mac has the important step of approval by Apple is probably the best of both worlds. This method is now adapted by Android and Windows except the hardware is not entirely in their control, so the performance and efficacy of their apps is still questionable. here is a glimpse of some pics depicting the come back of Apple after Jobs second tenure there. here is Steve Jobs talk when the first iPhone was released. I must say I haven’t seen this kind of passion in any of the recent products released by Apple but hopefully his spirit propels it to bring out some more fantastic devices!